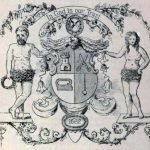 The evolution of the trades has been exemplified by the tailors in the city of Aberdeen. Eminent names from the turn of the 15th century included Willelmus Blacberd and Willelmus Scissor, among the leaders in their chosen field. The tailors first formed a trade association as part of their bid to prevent women from encroaching on their profession. In time the Aberdeen members changed their stance, making concessions in the 18th century to allow women to make some garments for the female market. It was the only association in Scotland to reach that compromise. Modern manufacturing and retail patterns have transformed the tailor from necessity to luxury, but the trade in Aberdeen has adapted and through admission from a variety of sectors is integral to the vibrancy and diversity of the Seven Incorporated Trades of Aberdeen. The annual bowling competition of the Incorporated Trades was held on Wednesday 15th August 2018 at Summerhill Bowling club. The evening commenced with tea and the bowling followed. The competition was an inter Trade round robin tournament which was won by the Tailors Incorporation, pictured right with the Gorrod Trophy. TAILORS TEAM : 3 members and (one weaver as a stand in )Mike Morrice, Sandy Wiseman, Ian Webster And Ed Shaw. On Friday 20th September the Aberdeen Tailors Incorporation held a fund raising Bingo evening in the function suite of the Ashvale Fish Restaurant to raise monies towards the funding of the annual Profession Development Awards for textile students at Gray’s School of Art. 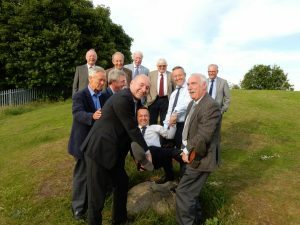 The monies raised ensured that the project will continue for a number of years. Around 70 family and friends of the Tailors members attended. At the Aberdeen Tailors Incorporation annual dinner and dance at the beginning of December 2017 a prize draw was held and members chose to donate the proceeds to Grampian Deaf Children’s Society (GDCS). GDCS is a local registered charity, affiliated to NDCS, who provide information, support and advice on all aspects of childhood deafness to the families of deaf children. 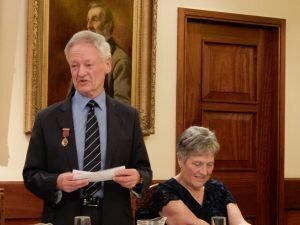 The Aberdeen Tailors Incorporation held their Annual Election of Office Bearers at Trinity Hall. The Aberdeen Tailors’ Incorporation has always had a strong affiliation and connection with the City of Aberdeen including Church, Town Council, Universities (RGU and Aberdeen) and local Charities. In June 2016, it was agreed that we look to further fostering the relationship we enjoy with RGU through the introduction of a Professional Development Award (PDA) Scheme. We were aware that the Weaver Incorporation had a long standing award scheme in place with RGU and upon discussion with Ex Deacon Convener Graeme Nicol of the Weaver Incorporation (who is a key member of the review committee of their successful scheme) along with Late Deacon Ian Webster and Deacon Mike Morrice of the Aberdeen Tailors’ Incorporation it became evident that there was a unique opportunity for the Aberdeen Tailors’ Incorporation to introduce an award scheme that would be complimentary to the existing Weavers Scheme. The Incorporation shall award a certificate and monetary prize to the student deemed to have met the standard required for this award. A runner-up certificate and award may also be presented. All tutors and students will be invited to attend a presentation of the award(s) at Trinity Hall at the end of the “Professional Development Award” scheme programme. The final submissions we receive will have been selected by the Course Leader(s) at Gray’s School of Art. The maximum number of submissions we will consider shall be twelve (12). Students would work on their submissions in Semester 1 (end September 2017 to mid December 2017), ready for submission by mid January 2018 with the awards event being held in April 2018. The first part shall consist of a written submission to a maximum of 500 words, describing the design concept, and what further developments and proposed applications are being considered for the end use of the design. A brief description of how the award will be used to further enhance the student’s studies through travel for a study trip, attendance at a specialist course or the purchase of fabric / specialist materials or equipment for the development of his or her stitch work / future studies and presentation of his or her portfolio. The staff of the BA (Hons) Fashion & Textile Design will select up to the best twelve (12) candidates on the basis of the written submissions and portfolios. These twelve (12) candidates will progress to give a presentation (up to 15 min duration) to three (3) members of the Aberdeen Tailors’ Incorporation and the Course Director, Fashion & Textile Design. The candidates may receive some questions. Copies of the written submissions and the candidate’s portfolios are required which must include the student’s name and year of study. The written part must be supported by a professionally presented portfolio of work based with a “presentation” board including illustration, specification (technical) drawing and working examples of toile / muslin, stitch work detail and materials used, etc and any appropriate outcomes. The work presented will be assessed on the level of technical and creative skills achieved in sample construction and for the overall quality of the work presented in the portfolio. All items in the portfolio must show the student’s name and year of study. The Incorporation shall award a certificate and monetary prize to the student deemed to have met the standard required for this award. A runner-up certificate and monetary prize may also be presented if deemed appropriate. Discretionary awards of materials / equipment may also be considered. We are extremely optimistic that the relationship between The Aberdeen Tailors’ Incorporation and RGU will be further enhanced and be mutually beneficial through the introduction of the PDA Scheme. We are keen to support these young students – build their confidence, recognise and reward their talents and to assist them in their future careers. Aberdeen Tailors’ Incorporation, part of the Seven Incorporated Trades of Aberdeen, have donated monies towards UCAN. UCAN are a local charity that was launched 10 years ago and they do fantastic work in raising awareness and for providing Urological care for patients and families right here in the North East of Scotland. The monies were raised at the Aberdeen Tailors’ Incorporation Annual Dinner Dance. The Tailors’ decided that the monies raised should go to a local worthy cause and UCAN was their unanimous choice. 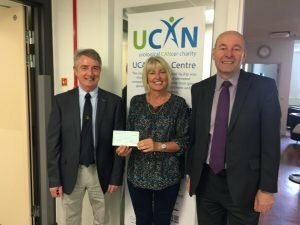 The cheque was presented to Gayle Stephen of UCAN on 23rdJune 2017 by First Master Derek Simpson and Deacon Mike Morrice of the Aberdeen Tailors’ Incorporation. 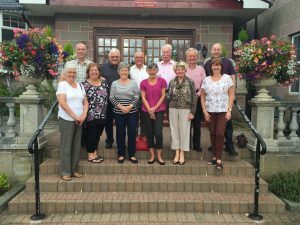 On the weekend of 19th August 2016, six Members of the Tailors’ Incorporation and their wives headed off to Kingussie for their Annual Weekend Jaunt. Our Boxmaster arranged accommodation at the Duke of Gordon Hotel for two nights. As we were all arriving at different times, it was arranged that we meet up in the Bar for pre-Dinner drinks. The rooms, allocated on arrival were found to be comfortable, with the Deacon being allocated one of the larger rooms which helped with the hosting of the pre-Dinner drinks on the Saturday night. The food at the Hotel was excellent with a large choice of dishes available, served by friendly, efficient staff who ensured that we would enjoy our stay. The members took part in a host of activities on the Saturday at Kingussie which included golf, a ride on the Strathspey Railway line, trip up the Cairngorms, Shinty and general sight-seeing and coffee breaks! The weather was really kind to us for what was an enjoyable weekend with excellent company, good food and the occasional drink. Philip Sainsbury being ‘douped’ by (L to R) Michael Morrice, Alan Sainsbury Derek Simpson, Richard Sainsbury and Michael Allen. Aberdeen Tailors’ Incorporation undertook a “Riding of the Marches” on the 23rd June 2016. This ancient ceremony was originally carried out on an annual basis but is now part of the acceptance of new members into the Tailors’ Incorporation. The name ‘March’ derives from the 16th century meaning of a boundary and is usually indicated by stone markers. Comparatively new members Richard Sainsbury and Philip Sainsbury were ‘douped’ (Doupin is to drop or dump someone down smartly on the buttocks, specifically in the initiation of burgesses by bumping them on the boundary stones) helping to instil in the memory of the new members the position of the boundary stones. The Tailors’ Douping stone is situated on Gallows Hill next to the Trinity Cemetery overlooking Pittodrie. The Aberdeen Tailors’ Incorporation hosted a supper to celebrate Ex Deacon Alan Sainsbury’s 50 years membership of their trade at Trinity Hall on Friday 19th February 2016. Alan joined the Tailors’ in 1966 and has served as their Deacon twice (1977 – 1979 and 1989 – 1991).